On this website, the term "Health Professional" designates all those in the health-related disciplines with expertise related to improving the quality of early education and before and after school child care. A Child Care Health Consultant is a health professional who works with early education and school-age practitioners to recognize and promote the health and safety of children, families and their teachers. 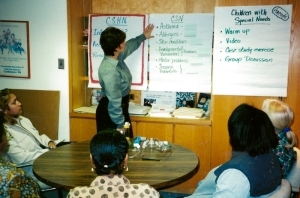 A Child Care Health Advocate (CCHA) is a designated staff member who makes sure that best practice in health, safety, and nutrition are integrated into program policies and procedures while carrying out the usual duties of a director, lead teacher or similar role.